Home › The Bible Re-Viewed › Is the Bible a Book about Men? What about Women? Is it any wonder that many women today have serious problems with the Bible and with Christianity? It doesn’t help that many large, traditional Christian denominations continue to shut women out of the highest positions in their organizations. But if the Bible itself supports gender inequality, how can we in the twenty-first century have any respect for it at all? Does the Bible really represent how the Christian God views women? How can a modern, self-respecting, capable woman really look to the Bible for spiritual inspiration? These are huge questions. We can’t deal with all of them in this article. However, we can set the record straight on at least a few points. In particular, we can highlight some of the strong female characters in the Bible who wielded a decisive influence on Judaeo-Christian history and faith. Men always ran the show in the Bible . . . or did they? Yes, it’s true: the Bible was written during a time when for the most part, men ran the show and women served them. That’s been the unfortunate situation ever since the Fall of Humankind took place in Genesis 3. However, when we humans disobeyed God and did things our own way instead of God’s way, things got out of whack. And in terms of gender equality, women have gotten the short end of the stick ever since. It’s only been in the last century or two that women have begun seriously moving back toward the original equality with men that existed when God first created humans on earth. However, the picture in the Bible is not quite as bleak for women as many modern critics say it is. Although women in Bible times did have a lower social status than men, unless they were slaves they were not the property of men, and they did have many rights. Both men and women could be slaves, and therefore actually be property. Women in the Bible commonly had an influence far beyond what we might expect based on their lower social status in Bible times. Yes, the Bible was written at a time when women had nowhere near the social status that they do in the West today. And certainly there are stories in the Bible that exemplify a brutal era in human history when women were often treated very badly. Still, women in Bible times didn’t always just meekly take whatever the men dished out. There are a number of key women in the Bible who asserted themselves, altered the course of the Bible narrative, and in so doing had a decisive influence on the spiritual history of the Judeo-Christian world. Though some did so in their traditional roles as wives and mothers, others ventured outside those traditional roles to leave their mark on history. Women were often key actors causing outcomes in situations where, had they not been present, there would have been a vastly different outcome. Let’s look at some of these influential women in the Bible. Eve is presented in the Bible as “the mother of all the living” (see Genesis 3:20). But she has become most famous for being tempted by the serpent, eating from the forbidden tree, and bringing a curse down on humanity. Quite a mixed legacy for the first woman in the Bible, isn’t it? Still, consider this question: Who drove the action in Genesis 3, Adam or Eve? Genesis 2 revolves around Adam: his creation, his placement in the Garden of Eden, his naming of the animals, and finally the creation of Eve out of Adam’s rib while he slept. But in Genesis 3, the action shifts decisively over to Eve. Despite the fact that Adam was right there with her (see verse 6), the serpent talked to Eve, not Adam. 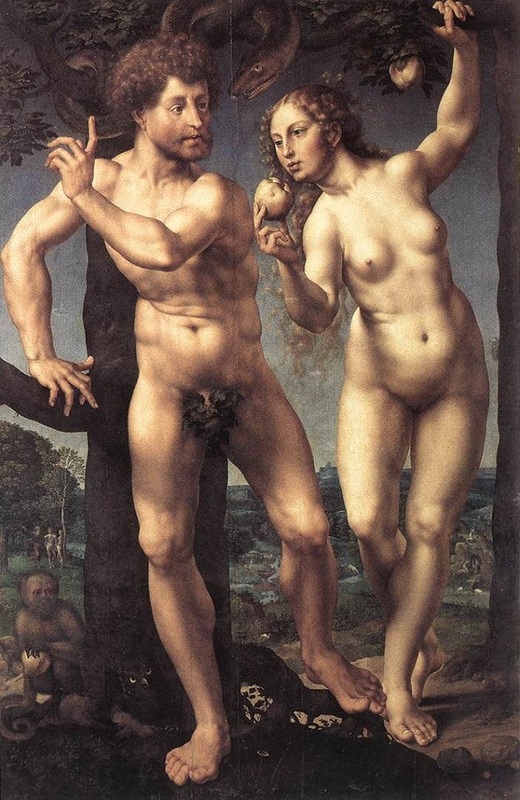 And Eve, not Adam, was the one who decided to eat from the forbidden tree. After she ate it herself, she then gave some to her husband, who also ate it. Okay, so it was a bad decision. But the point here is that the decision-maker—the one who initiated and determined the course humanity would take—was not Adam, the man, but Eve, the woman. In this story, which is the first major turning point in the Bible narrative, Eve is the stronger character. You can draw whatever conclusions you want from that. Many traditional Christians have drawn the conclusion from this story that women should not lead, and that that’s why, in the aftermath of Eve’s actions, God made man ruler over woman (see verse 16). But the Bible doesn’t actually say that. It simply tells the story. The fact remains that in the first major story in the Bible that hinges on the relationship between man and woman (after their initial creation), it was Eve, not Adam, who took the lead, and who determined the course that the two of them—and humanity as a whole after them—would take. After Eve, the next woman who has a major role in the Bible story is Sarah, wife of the patriarch Abraham, and mother of the patriarch Isaac. Sarah first appears in the Bible story in Genesis 11:29–31, under her original name of Sarai, as the wife of Abram, who was later renamed Abraham. Sarah plays an important role in several stories from Genesis 12 until her death in Genesis 23, at the age of 127. However, she is best known for becoming the mother of Isaac at the age of 90. You can read the whole story in Genesis 16:1–18:15; 21:1–21. For our purposes now, we’ll cover only some of the major events, and Sarah’s role in them. In those days a woman gained most of her status through her relationship with her husband, and through the sons she bore as heirs for her husband. Regardless of what we may think of that arrangement today, women of Bible times were well aware of that reality, and they commonly worked within it in order to make their mark on the world. That is precisely how Sarah came to be a decisive influence on the history of Israel, Judaism, and Christianity. Sarai had a problem. She had a wealthy, powerful, and good husband, which should have gained her high status in her society. But she had no children. And that, for her, was an intolerable situation. Of course, by today’s standards in the West, such an arrangement would never fly. But in ancient Middle-Eastern culture, it was an accepted and even honorable course of action. And it was set in motion, not by Abram, but by Sarai. We’ll pass by how Sarai blamed Abram for her troubles, even though she herself was the one who brought it about. What’s most fascinating about this vignette is that even though the child to be born would be Abram’s heir, he deferred to his wife, and let her decide the fate of Hagar and the child. Clearly Sarai had clout in the relationship. Clearly Abram not only loved her, but respected her and her wishes. Sarai was far from the meek, subservient wife who is the caricature of wives in Bible times. And as the story unfolds, her will and her actions continue to have a decisive influence on how events unfold. After an encounter with an angel of the Lord in the desert, Hagar did return to Sarai in a humbler state of mind, and she did bear a son for Abram, whom he named Ishmael. For thirteen years, Ishmael was Abram’s heir. And given Sarai’s advanced age, it certainly looked like he would remain Abram’s heir. This same message and prediction was reaffirmed in Genesis 18:1–15 by three men representing the Lord, who visited Abraham. And indeed, Genesis 21:1-7 tells the story of Isaac’s miraculous birth, when Sarah was ninety years old. And this is how it happened that even though Abraham loved Ishmael, and had asked God to bless Ishmael as his heir (see Genesis 17:18), it was Sarah who ensured that God’s will would be carried out, and that Abraham’s lineage would pass through her own son Isaac—even though Ishmael was Abraham’s firstborn, and should therefore have been Abraham’s primary heir, through whom his lineage would pass. In short, it was Sarah, not Abraham, who ensured that the three great Patriarchs of the Bible would be Abraham, Isaac, and Jacob, not Abraham, Ishmael, and Nebaioth (see Genesis 25:12–18). Well . . . she wasn’t actually the one who ensured that it would be Jacob . . . .
That should have been, “mother of Esau and Jacob.” We’ll get to that in a minute. Genesis chapter 24 is often titled “Isaac and Rebekah.” But it’s really the story of Rebekah, and how she became Isaac’s wife. Isaac himself appears only in the last few verses of the chapter. In fact, Rebekah almost eclipses Isaac in the few chapters that tell their story (Genesis 24–28). She figures in most of the events of those chapters, and in the end, she has a more decisive impact on the lineage of the Jewish people than her husband Isaac does. Genesis 24 tells one of the most engaging stories in the Old Testament. There aren’t many love stories in the Bible, but Genesis 24 is one of them! And it’s not like any other love story you’ve ever read. In it, Abraham, who is now getting very old, sends his (unnamed) senior servant from his adopted home in the land of Canaan northward to the home of his relatives in Aram Naharaim (the northwestern part of the Fertile Crescent) in order to find a wife for his son Isaac. Before he had finished praying, Rebekah came out with her jar on her shoulder. She was the daughter of Bethuel son of Milkah, who was the wife of Abraham’s brother Nahor. The woman was very beautiful, a virgin; no man had ever slept with her. She went down to the spring, filled her jar and came up again. “Drink, my lord,” she said, and quickly lowered the jar to her hands and gave him a drink. To make a long story short (you can read the whole story at the Genesis 24 link above), the Lord did make his journey successful. As soon as he had told his story to Rebekah’s family, they immediately agreed that Rebekah should go with him and become Isaac’s wife. But . . . the next day they started getting cold feet. And who could blame them? Suddenly this man they’d never seen before had shown up with an elaborate story, and now he wanted to take their beloved daughter and sister with them to marry a man they’d never met? The valuable gifts that he gave to her and to them were fairly convincing, but still . . . it was all a bit sudden, wasn’t it? First of all, this story should put to rest the idea that women had no voice in ancient times. While Rebekah’s mother and brother dithered and delayed, they came up with the idea of asking Rebekah herself. They probably thought she would also think it was all too sudden, and would opt to delay and stay for a while before leaving. But that’s not what she did. Rebekah, having met this man only yesterday, was ready to go with him today. She saw her opportunity to be married to a wealthy, powerful, and God-fearing man. And though she had never laid eyes on him, she was ready to go immediately, and seize that opportunity. As forceful as her personality was, the chapter also tells us that she was not only a beautiful woman, but a good one. 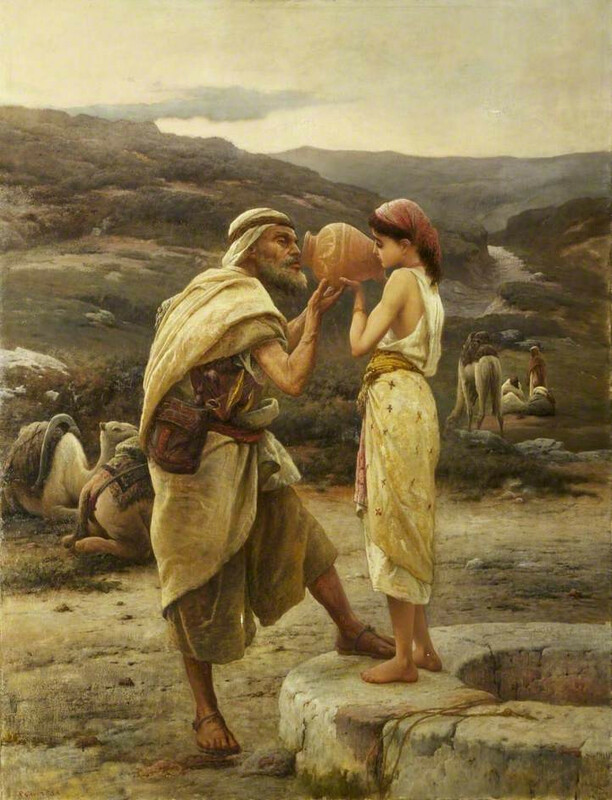 Seeing unknown strangers visiting her town, she had willingly provided for their needs, going beyond what was asked of her by drawing water not only for the servant himself, but for all of his camels. This was no small thing. Drawing water was heavy work, and that was a lot of big bodies to provide water for! However, in her culture there was a sacred duty to be hospitable to visiting strangers. And Rebekah honored both these visitors and the customs of her culture by providing abundantly for their needs. And so, embedded right in the narrative of the story, Genesis 24 paints a clear picture of a young woman who was ambitious, knew her own mind, and yet had consideration for visitors and strangers, and thoroughly honored the customs and mores of her people. Rebekah was not only a beautiful woman. She was a woman of character. And that endeared her to her husband Isaac. However, Isaac may have gotten a little more than he bargained for! Esau and Jacob . . . or is it Jacob and Esau? In the course of time, Rebekah bore twin boys for Isaac, named Esau and Jacob. And though Esau was the firstborn of the two, Jacob was ambitious, and looked for opportunities to supplant his (slightly) older brother. You can read their story in Genesis 25:19–34. It was an eventful birth. The babies “jostled each other” in the womb, setting up a fraternal competition that would last much of their lifetimes. Esau came out red and hairy, which led to his two names, Esau (which means “hairy” in Hebrew) and Edom (which means “red” in Hebrew). 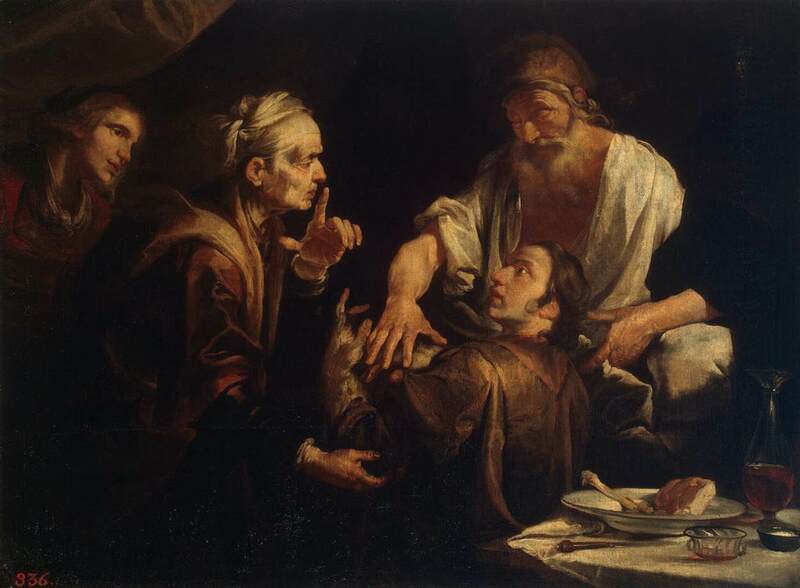 Jacob came out “grasping Esau’s heel”—and the very name Jacob means “he grasps the heel,” which is a Hebrew idiom for a deceiver and a supplanter. In contrast to his brother, Jacob was a smooth-skinned man, and he loved to stay at home in the tents. Esau, on the other hand, was a rough and rugged outdoorsman, who loved to go out hunting in the open country. Is it any wonder that Esau was the favorite of his father Isaac, while Jacob was the favorite of his mother Rebekah? Jacob began the task of supplanting his brother by finagling his brother into selling him his birthright (the right to inherit a double portion of his father’s estate) for a bowl of stew. The fact that Esau was willing to accept such a lopsided deal shows a weakness of character in him—which was the reason he could not hold his place as the firstborn. And the fact that Jacob was willing to make that lopsided deal with his brother demonstrates Jacob’s sharp and shifty character, for which he got his name. But what Jacob did to his brother in finagling him out of his birthright was nothing compared to how Rebekah pulled the wool over her husband Isaac’s eyes, and cheated Isaac’s elder and favorite son Esau out of his father’s all-important blessing on the firstborn, causing it to go to her own favorite son, Jacob, instead. The story is too long to recount here. You can read it for yourself in Genesis 27. It is a powerful and poignant tale of deception and betrayal. And Rebekah is the ringleader. Once Isaac had been tricked into giving the blessing of the firstborn to the younger of the two boys, it could not be undone. When Esau entered immediately after Jacob had departed, the deception was revealed. Jacob, under the tutelage of his mother Rebekah, had now fully supplanted his older brother Esau as his father’s firstborn and primary heir. In the aftermath, when Rebekah got wind of Esau’s plan to kill his brother Jacob after their father died, she arranged for Jacob to be sent back to her own family in northwest Mesopotamia. And that is where Jacob himself became a wealthy and powerful man. 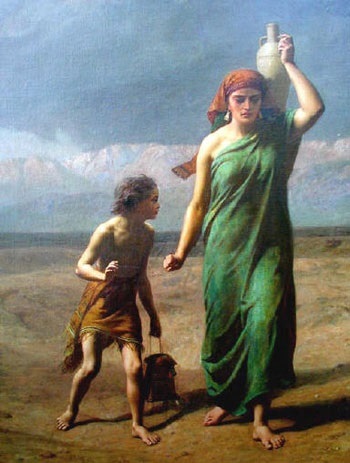 For our purposes today, the story is that of Rebekah, whose strong, decisive character, together with a deviousness that she clearly passed on to her son Jacob, trumped the will of her husband Isaac, and caused the lineage of the Jewish people to pass, not through the older son Esau as it should have done by ancient custom and by the will of their father Isaac, but through the younger son Jacob instead. Jacob was later renamed “Israel” (see Genesis 32:28). And that is where the Children of Israel got their name. No survey of strong, decisive women in the Bible would be complete without the story of Deborah. You can read Deborah’s story, and her song, in Judges chapters 4 and 5. 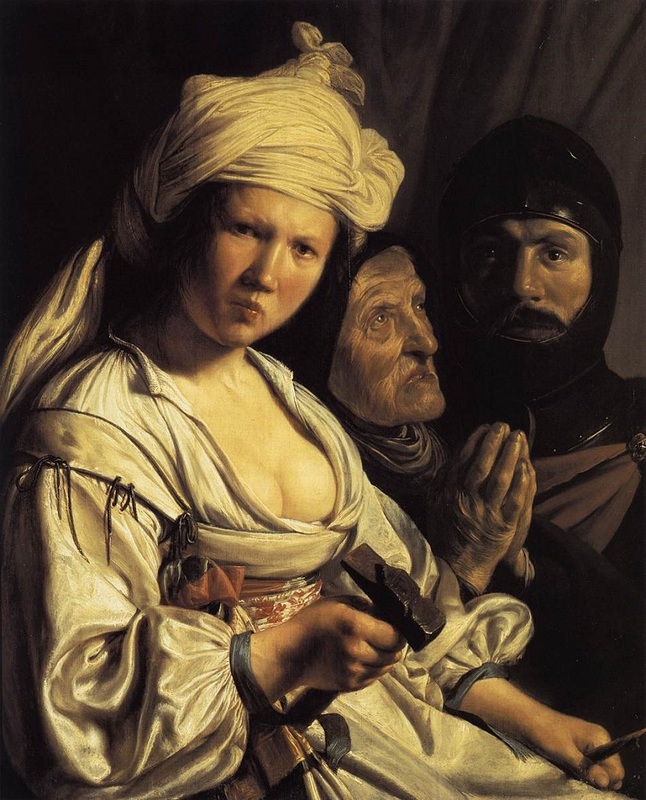 It is sometimes called the story of Deborah and Barak. But in the story, Barak, a man, looked to Deborah for strength and inspiration, and not the other way around. Barak insisted that Deborah must go with him, or he and his men would not go. And that is precisely what happened. Barak and his army did rout Sisera and his chariots and soldiers. But Sisera himself escaped, and took shelter in the tent of a woman: Jael, the wife of Heber the Kenite. She lulled him to sleep . . . and then drove a tent peg through his temples and into the ground, killing him. But in this story of victorious combat, it was a woman who served as Israel’s prophet and leader, and delivered God’s commandment to the people to go out and fight their enemies. And it was another woman who dealt the final fatal blow of the battle. And finally, no survey of women who played key roles in the Bible story would be complete without Mary. In the Gospel story, Mary has two roles: she was the mother of Jesus, and later in life she became a follower of Jesus. 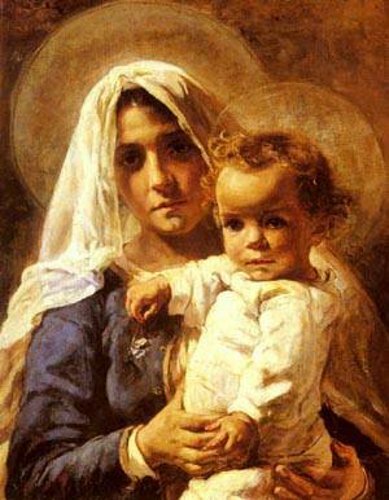 Now, being the earthly mother of the one who would be called “God with us” (Matthew 1:23) is no small honor—and no small responsibility. Mary was chosen by God for that honor and responsibility for the same reason so many other key women in the Bible took their place in history: She was a woman of character and decisiveness—and a willingness to follow where God led her, and take on the great task that God gave her. When an angel of God came to Mary to announce to her that she would bear a child who would be called the Son of the Most High, she was perplexed. You can read the story in Luke 1:26–38. 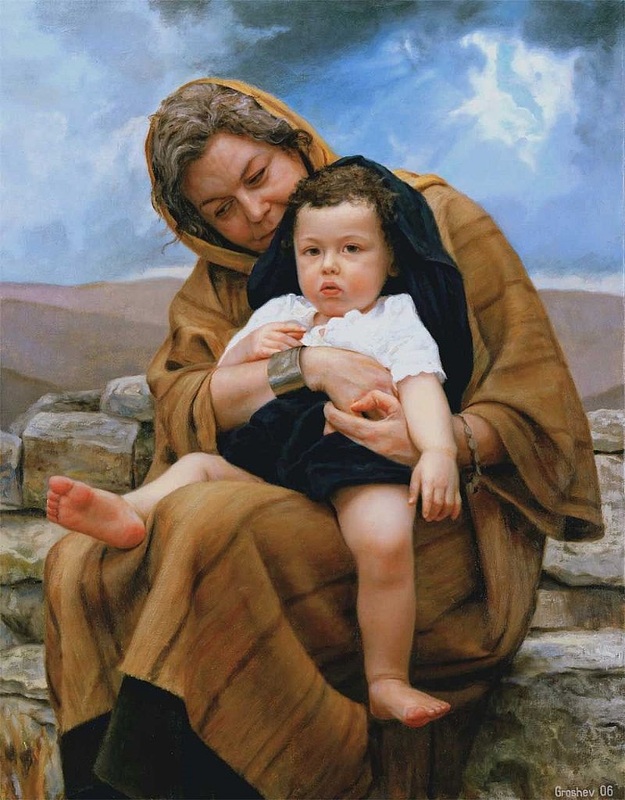 It was only by another angelic intervention that Joseph accepted Mary as his wife, and accepted her baby, whom he was instructed by the angel to name Jesus, as his son. It is clear from the Gospel story that Mary was indeed perplexed by this eldest son of hers. Both the miraculous manner of his birth and his words and actions as he grew up caused her much surprise and consternation. Then Jesus entered a house, and again a crowd gathered, so that he and his disciples were not even able to eat. When his family heard about this, they went to take charge of him, for they said, “He is out of his mind.” . . . Here Jesus’ family, including his mother and brothers (Joseph had probably died by then), think Jesus has gone crazy, and they come to “take charge of him.” But he doesn’t even recognize them as his mother and brothers. Later though—probably after Jesus’ death—Mary herself became one of his followers, and moved among his disciples. So if anyone ever tells you that women have no clear voice or role in the Bible, don’t believe it! Yes, it’s true that in Bible days women were considered secondary to men. And yes, it’s true that women commonly got the short end of the stick. And yet, these few stories of only some of the strong, decisive, intelligent, and influential women in the Bible show that even in the patriarchal societies of thousands of years ago, women made their presence felt and their voices heard—and they played a key role in determining the course of the Judaeo-Christian history. ‹ Was Jesus Christ Human from Mary, or Human from God? misinterpretations of Paul’s writings on wives submitting to husband’s, etc. The culture of the Biblical days were a challenge to Paul but in no way was he saying that about women anymore than he condoned slavery by saying slaves submit to your master, etc…the real deal is that we are all to submit to one another as unto the Lord, simple! Thanks for stopping by, and for your kind words and good thoughts. Yes, there is much backward and limited thinking even today. But we can continue to put the word out and reach as many people as have ears to hear.